Take your first steps in the game forwards towards the green hexagonal object on the ground directly ahead of you. This should trigger the appearance of Bianca who will tell you to take the Dragon Rune over to the Dragon Spirit. It's good advice really, continue on a course straight forwards, pick up the rune, and then walk over to the large green dragon statue. This Dragon Spirit will bestow upon you the power of Bubble Breath. This is key to collecting all of the dragonflies around the realm. The level at the moment is fairly restricted and kind of directionless. First things first, your first dragonfly. About turn and look to the left of the large door (which does nothing!) and you should see a green thing moving about a bit. Run over to it and Sparx will tell you all about Bubble Breath. This Dragonfly is one of the annoying ones, ones that you need to capture yourself. Simply get close enough for Bubble Breath to capture it, this means charging towards it and breathing bubbles in the hope that you manage to get it. You might need to run around after it for a little while before you manage to capture Toons. Next on the agenda around here is to go back to the large door where you started the game and continue past towards the river. At the edge turn left and go up the platform and towards the yellow cheetah standing at the end. Hunter will begin your gliding training as always. Follow him by gliding over the river and then up the slope where he's waiting. If you fall off just go down the river to where you can jump back up onto shore and get back up to where Hunter was. Once you succeed in following him he'll ask you to jump, glide and hover next. Once you make it approach Hunter again and he'll give you Bubbles, you don't even need to chase it down or anything. Just to the right now you'll find a Challenge Portal. Your task here is to flame eight scarecrows that are dotted around the level before the meter on the right of the screen becomes empty. The first scarecrow is directly beneath you, so drop down and flame it. Charge forwards now along the left and past a passageway (it leads to the Electric Gate) and you should spot the second scarecrow directly ahead. Continue hugging the wall around to the right and right next to the river is number three. Cross the river for the fourth, then charge along to the right and up to where you met Hunter before. The fifth scarecrow is up here, turn around and run back past the large door you started the game at, all the way past a waterfall to the sixth. Go left hugging the wall and then down a small indentation in the rocks to where the seventh is. And finally the eighth scarecrow is further along next to the Spirit Dragon statue. If you don't quite make it then just go back to the Challenge Portal and try again until you do rescue Jeet. Once you've beaten it the Challenge Portal vanishes. Well, that's about all you can do in Dragon Realms for now. Finish collecting any gems you can find around the place (I believe 224 is the total you should be able to get, but it isn't of any real importance right now) and then head towards the Spirit Dragon. Jump up the platforms behind him to the right and talk to the tall dragon, Miyagi. Provided you've rescued at least one dragonfly you will be able to go to the Dragonfly Dojo, simply step on the circle next to Miyagi and wait for the level to load. Back in the Dragon Realms your first visit should be to the Spirit Dragon to earn the Electric Breath. Now you should head towards the left end of the level and go down towards the Lightning Breath Gate (they seem confused with their naming). Give the lock a good zap with your new Electric Breath and the gates will swing open. Continue down the corridor and Sparx will teach you how to look around. Sitting in the middle of this open area is a green dragonfly. There's also a Lightning Breath Challenge Portal 'round the fence to do. Switch to Electric Breath and go through it. The first two poles are over to the left on top of some bales of hay. Instead of wasting time jumping up them you can just zap the bottom of the bales and it'll get the pole on top. Once both are done go to the right and into the alcove where an alligator (named Jimmy-Bob) is. Run in there, zap the pole and dash back out. The next is just past the tree on the right of the entrance to the whole area. Keep to the right and drop down into the lower of the two paths to the water. Zap the pole and then go back and jump up to the higher path, run around it and the sixth pole is in the middle up here. Drop down and go right to the seventh, into the water and across onto the island for the last one. Typo. Now that you're in the bay area you should look for the green dragonfly running about on shore. That's all of the dragonflies that you can catch for now. Gather any remaining gems you want to bother with and head to the ladder near where the Lightning Breath Challenge Portal was, climb it and talk to Farmer Bill. Seeing as you have enough dragonflies (six) you can jump onto the UFO and enter Crop Circle Country. If I've managed to get it right you should be able to have 554/700 gems by this point. Just another quick stop, make sure to go to the Spirit Dragon and gain the Wing Shield ability from the Dragon Rune you picked up in Luau Island. Then go talk to Pudgy nearby up on the platform behind you. Step into the vortex and you're off to Cloud 9. The last major visit to the Dragon Realms at last. First take your Ice Breath Dragon Rune to the Spirit Dragon and gain Ice Breath. Jump up the platforms to the right and make your way to the Ice Gate which you can now (legitimately) get through. Part way along the corridor to the next area Sparx will teach you how to read the Atlas, useful if you hadn't worked it out halfway through the game already. Continue on and go left when you emerge in an open area. Here you'll see a temple, in the area in front of it you'll see a green dragonfly to catch. Gather the gems and turn around again, instead going to the right of the corridor you arrived down, and down another corridor. Run along into the open where you'll find another green dragonfly. And there's an Ice Breath Challenge Portal right next to him. The task this time is to put out eight fires. The first is just inside the decorated archway, second and third along the outside a little, fourth down the corridor back to the temple area. Keep on down the corridor, the fifth is to the left of the exit, the sixth over to the right. Seven and eight are in the area with the temple, on both sides of it. Head back to the area where the Challenge Portal was and go up the steps on the left side of the area, gliding over several gaps to get up to an icy area with a large balloon. There should be a dragonfly flying about underneath the pavilion next to it. You should now have completed Dragon Realms with all 800 gems found and 10 dragonflies caught and your next destination is Dragonfly Dojo. you can charge thruogh locks. i wish i new this befor i beat the game!!! i mean look at those guys there so cool as dragon flys say. just kiddin i dont know what they say except. 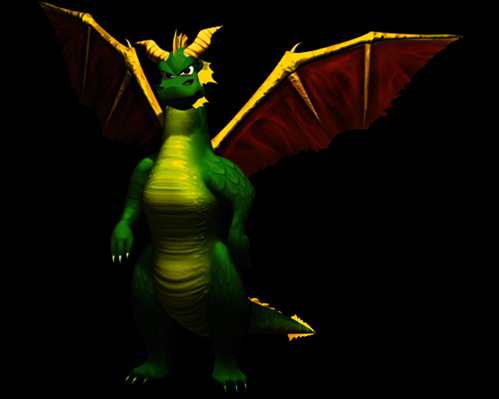 SPYRO ROCKS!!!!!!!!!!!!!!!!!!!!!!!!!!!!!!!!!! I think we al know how to play, SuperSpyro700. To jump, press the X button. To glide, press the X button again in midair. Don't forget to press forward on the Directional button or the Left analog joy stick while glideing. Press the Triangle button to Hover and to end glideing.